What Car Parts Have You Used As Field Expedient Bottle Openers? I know what you cancer-stick-addicted types are saying: "But you can use a lighter to open a bottle!" Yes, yes, a key works too, but there's something extra satisfying about opening bottles with your car. We had a tailgate party last weekend, prior to watching the hapless Oakland A's get shellacked by some team from behind the Orange Curtain. In attendance were the usual suspects: Belvedere Adrian's wagon, my '97 P71 Crown Vic, and the most reliable vehicle I've ever known. Naturally, while we brought a dozen different types of gourmet sausages to put on the grille, we sorta spaced on an opener for the elitist non-twist-off beer we prefer for such occasions. 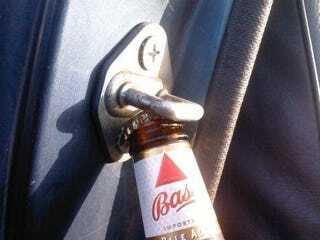 No problem, though- the late-80s Toyota pickup's door latch makes an excellent bottle opener. I know that our readers will have many useful vehicular-bottle-opening tips for us, so let's have 'em! But first, what's that vehicle driven by our tailgate neighbors? Why, it's a veteran mid-60s Transporter pickup! Good tailgating vehicle choice, we say. Since this is Oakland, I didn't have to go far to find a donk. How about a mid-70s Malibu with the crypto-donk treatment?